10.00am data shows, HDFC twins dragging down both Nifty and Bank Nifty. Yesterday was a Yes Bank day. It shot up 31% and which helped about 215.01 points up in bank nifty index. That saved the Bank Nifty from collapsing. Crude prices gaining for a fourth day and OMCs counters facing selling pressure. Meaningful Call writing was seen at 10,800.It will act as a crucial resistance for the February series. Nifty likely to face resistance at 10780 and support at 10680. Nifty forms bearish candle for the 6th day in a row. 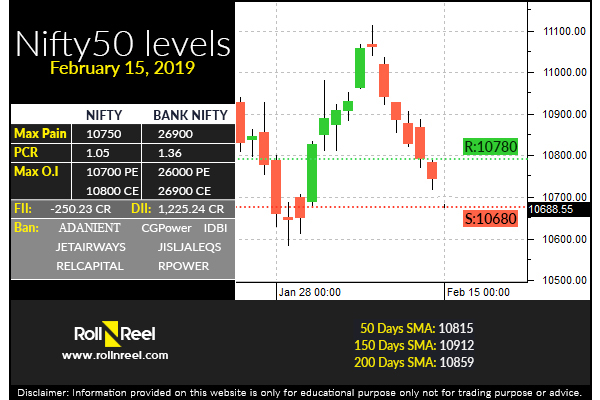 Six consecutive sessions of fall appears to have dragged down the Nifty50 into oversold territories from where a bounce back looks inevitable. Formation of Nifty share is in downtrend. Nifty Bank PCR at 1.36.